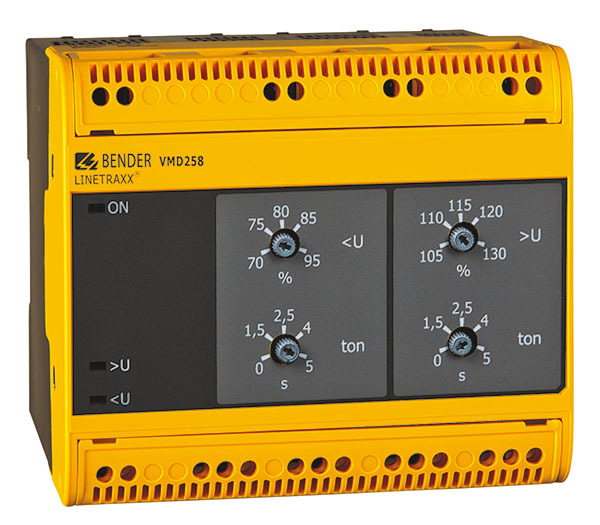 The voltage relay VMD258 monitors three-phase AC systems for undervoltage and overvoltage (window function). Neutral conductor connection is not required, therefore it is suitable for 3AC systems. The voltage to supply the electronics is taken from the system to be monitored. The supply of the electronics, the relays and the connection for the external energy storage device are isolated from the system by means of double isolation. Special input transformers attenuate interferences from the system. The response values for undervoltage and overvoltage as well as the response delays are continuously adjustable.